"Apple Computer's Mac Mini is finding its way to more store shelves, with Best Buy planning to carry the $499 computer nationwide. "Mac fans have noted that the diminutive desktop appeared on some store shelves last weekend, and Merrill Lynch issued a research note on Monday talking about the potential impact of such a move. Apple confirmed the plans on Tuesday." "One in five Americans under 30 now owns a portable MP3 player, thanks largely to the success of the iPod. But 96 percent of computer users still have PCs. Not wanting to squander a drop of the iPod's power as a crossover product, Apple created a desktop computer in the iPod's image that's likely to be seen by a much wider audience. It then spoke to that audience by pointedly marketing the flat-panel iMac G5 as 'from the creators of iPod,' capitalizing on the cool factor...."
"A reader who works in an Apple CMAA let us know that last week he got no less than 5 almost brand new eMacs that had had a breakdown. If those failures weren't all identical, the motherboard of the 5 machines had to be changed...."
"Bottom line, Consumer Reports said, with certain limitations, the Mac Mini offers a way into the Mac world at a lower price than ever before." "Being a reviews editor at PC World means putting my hands on a lot of computer products, many of which I load onto my home PC, where I can look at them during my spare time evenings and weekends. "With all of the loading and unloading software on the PC, it occasionally chokes, sometimes so severely that I no longer have access to essentials like e-mail and Photoshop. That made me wish for a second PC. But with very limited work space, it would have to be small, and share the keyboard, mouse, and LCD with my existing tower. "Inexpensive and charmingly small, the Mac Mini was just too enticing to pass up. Yes, it's not running Windows, but that actually made it even more attractive - it would be more resistant to viruses and spyware, and I would be far less likely to junk it up with test-ware. The really big question was: How well would it cohabit with my Windows PC?" "The Mac Mini isn't just competition for Shuttle computers and mini-tower PCs. It's also competition for the much smaller embedded development boards that many users are building custom applications around. Peter Seebach takes a look at the Mac Mini as an embedded development platform. "A lot of early coverage of the Mac Mini compares it to desktop PCs, or even micro-ATX cases and other small PCs. What it looks like, though, is a high-end embedded development board. Comparing it to other embedded systems, you'll find that it's not much bigger, and it's smaller than some. It has a broader array of connectors, a faster processor, support for a very large amount of memory, and comes with self-hosted development tools. In short, if you look at it as an embedded development platform, it's a competitive one." "My daughter, Katie, made a suggestion the other day that's so obvious, I'm surprised I hadn't already thought of it: make the Mac mini available in different colors. The iPod mini is offered in a half-dozen different hues, so why not the Mac mini? "One of the goals with the diminutive Mac is to bring new users to the Mac platform, namely those who have been drawn to the world of Apple thanks to the iPod. For those who've bought the traditional iPod or an iPod shuffle, the Mac mini could still be available in its current white form. "But those who have silver, green, pink, blue, etc., iPod minis might prefer a Mac mini to match. I know my daughter loves the petiteness of the small Mac, but would rather have a blue one. (Sorry, Katie, but you'll have to live with your aging iBook for a while.)" Note: Colorware already offers colored Mac minis. "Don't toss that old Mac or PC yet. Yes, I know you'd be hard pressed to fit a slice of processed cheese in the tiny case of the Mac mini, but expansion isn't limited to the mini's tiny interior. "In this tutorial, we'll take advantage of the speed and power of FireWire to turn your mini in to a fast, powerful backup machine. And we'll do it using hardware you didn't even realize you had." "So what defines an this appliance as an iHome device? "What are the particular aspects of an object that define it as an appliance and what do we consider an appliance actually is. "My old circa 1950's Websters defines it clearly. "I read what the tech. gurus are saying about the small form mass produced low cost appliance call the Mac mini. Yes I am convinced that this device is indeed a true Hi 5 plug and play appliance which will enhance life styles and add uniquely to the super appliance iHome." "What makes a Mac mini an iAppliance? "Well the connectability for one aspect and the ability to run Unix and other environments which can host some Intelligent agency software. "The wireless capability of AirPort Extreme from Apple and this type of device interconnectivity is based upon the 802.11g specification and is certified, IEEE 802.11b. The option of installing an internal Bluetooth module makes the plug and play ability and interconnection with other iAppliances and devices like my Moto e398 a iconnect possibility but for the time being I choose to sync through a USB cable supplied by Moto that came with the Phone. 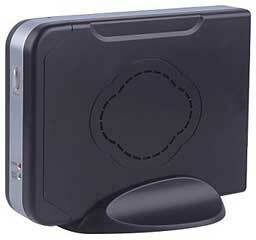 To have the facility of a Bluetooth attachment is a real bonus." Griffin RadioShark USB FM/AM tuner"
"AltiVec? Velocity Engine? VMX? If you've only been casually following PowerPC development, you might be confused by the various guises of this vector processing SIMD technology. In this first installment of a three-part series, Peter Seebach gives you the basics on what AltiVec is, what it does - and how it stacks up against its competition. "On August 31, 1999, Apple announced that it would begin selling computers that were considered 'supercomputers' by the U.S. government, and could thus not be exported to some countries. This caused a lot of controversy at the time. Now, five years later, lots of computers are faster. But what is still interesting is that the technology that Apple used as the basis for this fairly dramatic claim is still in use, and it's still of major interest to developers trying to get the best performance out of certain kinds of tasks. "Motorola® AltiVec" is one of the names . . . for a specific example of Single Instruction, Multiple Data, or SIMD, execution. Normally, a single instruction to a computer does a single thing. A single SIMD instruction will also generally do a single thing - but it will do it to multiple pieces of data at once, thus the fairly unimaginative (but at least pronounceable!) name. The multiple pieces of data being operated on at once are often called vectors, hence the name AltiVec. More traditional supercomputer vector processors might well store fifty or more pieces of data in a single vector register. AltiVec is a little more conservative...."
"VMX was the original code name for this extension inside IBM. That term isn't in widespread use, with generic terms like SIMD or vector processor preferred in IBM documentation. AltiVec is Motorola's trade name for this set of extensions, and the company thoughtfully trademarked the term. That's why Apple uses the name Velocity Engine, which is nicely generic and refers to either company's implementation of the technology." PR: Other World Computing (OWC) has announced it has reduced prices by as much as $40 on its popular OWC Mercury Extreme G4 processor upgrades. Mercury Extreme G4/1.4-1.5 GHz $429 (was $459.99). "The OWC Mercury Extreme G4 line is one of our best sellers," said Larry O'Connor, president of OWC. "These easy-to-install, plug-and-play processor upgrades are the easiest way to speed up your Power Mac G4, and now they're an even better value." Each Mercury Extreme G4 includes 256 KB of 1:1 L2 cache on-chip and 2 MB of high-speed L3 cache, and is covered by OWC's three-year limited warranty and 30-day 100 percent money-back guarantee. All models are compatible with Apple PowerMac G4 AGP Graphics (Sawtooth), Gigabit Ethernet, Digital Audio and Quicksilver models, and with Mac OS 9.2.1 or higher, all versions of OS X 10.0.4 and later including 10.3.x Panther versions. PR: Sonnet Technologies has reduced pricing by $20 to $50 on several G3 and G4 processor upgrade cards and PCI adapter cards for various PowerBook, Power Macintosh and Power Mac computers. Prices are now as low as $199.95 MSRP for the Encore/ST G4 1.0 GHz, marking the first time Sonnet has offered a 1.0 GHz upgrade for under $200. These price reductions make upgrading a Mac with quality Sonnet products more affordable than ever. Encore/ST G4 1.2 GHz (Part No. SG4-C1200) now $249.95 (was $299.95). Encore/ST G4 1.7 GHz (Part No. SG4-C1700) now $449.95 (was $499.95). These Encore/ST G4 upgrades are compatible with the Power Mac G4 Cube. Encore/ZIF G4 700 MHz now $199.95 (was $249.95). 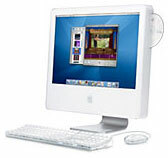 The Encore/ZIF G4 700 MHz is compatible with the Power Macintosh G3 All-in-one, Desktop, Minitower, Blue & White, and Power Mac G4 (PCI Graphics). Tango 2.0 FireWire/USB Combo PCI Adapter Card now $49.95 (was $69.95). The Tango 2.0 is compatible with almost all Power Macintosh models. Tempo Serial ATA Host Controller PCI Adapter Card now $79.95 (was $99.95). The Tempo Serial ATA is compatible with almost all Power Macintosh models. PR: Giga Designs, a manufacturer of high performance processor upgrades for Apple Macintosh computers, is now shipping the fastest (2.0 GHz) G4 processor upgrade available for Apple AGP equipped G4 Power Macs. The new G-celerator™ AGP 7A series upgrade uses the latest G4 (7447A) processor available from Freescale™ (formerly Motorola). The new 7447A processors feature a 512 KB on chip L2 cache running at full processor speed. All of the G-celerator AGP 7A series upgrades are proudly assembled in the US and carry a three year limited warranty. They include Giga Designs 47A Firmware Updater and the GigaMeter OS X speed & processor ID extension. System requirements: G-celerator AGP 7A series upgrades require OS X 10.3.5 or later. The upgrades are OS 9.2.2 and OS X dual boot configuration compatible. While these upgrades boot under OS 9, Giga Designs does not test, warrant, or support third party software operation under OS 9. PR: Guest PC is another computer inside your Mac. That computer is an emulated x86 PC. It is virtual, and it has no separate monitor, mouse, keyboard, or hard drive. It is just a Mac OS X program that allows you to install the Microsoft Windows operating system on your Mac and use the software developed only for Windows compatible computers. Guest PC works just like a usual application and you can easily switch between Windows and Mac OS X desktops at will. Guest PC sells for $69.99. PR: QuickerTek has further extended their line of wireless Macintosh products by announcing a new omnidirectional antenna for the entire Mac mini line. 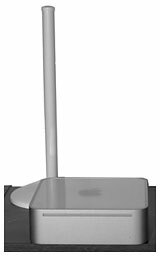 The new Mac Mini Antenna offers 5.5dBi of RF power, which means that wireless networking distances can be as much a three times further than when using the stock antenna. The suggested retail price is $80. A three-foot coax cable comes with the antenna for easy mounting. It works with Mac OS 9 up to and including Mac OS X 10.4 "Tiger". The Mini Antenna is equally at home in AirPort and AirPort Extreme networks. This new design does not alter the case in any way and is styled to match the Mac mini case. "Ever since the mini exploded onto the market, we've been cooking up antenna ideas for it. This new Mini Antenna makes sense for both desktop and mobile mini users. Just because mini users have the coolest small Mac available doesn't mean that they have to be shortchanged on wireless networking range," stated Rick Estes, president QuickerTek. "Our new Mini Antenna not only triples wireless range, it also matches the mini case perfectly," he continued. "We are very impressed with the mini and are planning more enhancements," he stated. "This new QuickerTek antenna for the Mac mini boosts the versatility of Apple's latest engineering marvel while significantly boosting the range of the Mac mini's wireless connection. QuickerTek has paid attention to the attractive design of the Mac mini with an externally mountable antenna that does not mar the case and actually complements the stylish lines of the Mac mini. Rick and his team of antenna wizards have come up with another hit!" stated Don Mayer, CEO of Small Dog Electronics. QuickerTek is a recognized leading innovator of antennas and RF products for Apple desktop and portable computers. QuickerTek products can be purchased at Mac dealers such as Small Dog Electronics, TechnoWarehouse, PowerBook Medic, and many others. International customers can order from AM Micro in the UK and MacLand in Germany. PR: The Que! M3 UltraSlim hard drives are housed in a sleek, slim, and stackable case with fast FireWire or USB 2.0 connection. Choose from a large variety of drive capacities at speeds up to 7,200 rpm for your best performance for audio, video, image, or data storage. Simply connect the Que! M3 drive to any FireWire or USB 2.0 enabled computer for convenient sharing and transportation of large size critical information in a flash! For extra large storage configurations simply daisy-chain FireWire devices or use USB 2.0 rated hubs to connect multiple drives to a single connector on your computer. The Que! M3 offers all the advantages of true plug and play FireWire or USB 2.0 interface with hot swappable connectivity so you can grab it and go. Designed for the new age of the digital recording and video real time editing, our Que! M3 drive solutions will put you at the fore front of the digital revolution with the versatility you need to work and play your way. The Que! M3 UltraSlim includes software for Macintosh. PR: XrackHosting is pleased to announce their new Mac mini dedicated hosting service! This powerful little machine provides a perfect step up from shared hosting without all the expense - and with the included Mac OS X Server, you will have the most powerful Mac OS at your fingertips! Finally, a Mac OS X-based Web hosting provider that gives you the platform you want without paying a high premium! Even better, we are customer service driven - many say this, but few deliver. This means that we truly appreciate your business, and will do whatever we can to keep you happy. Several hosting packages are offered, priced from $9.95 to $49.95. To celebrate the launch of our support of one of Apple's coolest products, we're giving away another! Sign up for a dedicated Mac mini by April 15th, and an iPod shuffle is yours for the taking! We are located directly inside of the Level 3 facility in Orlando, Florida. No other Mac shared host can claim this kind of connectivity... We offer unmatched reliability, performance and redundancy! There are peering points with many major networks right inside the building... this means quicker response times for users of your site, no matter where on the globe they are coming in from. We're a Mac-based hosting provider, so why not use some of the slick tools that Apple has given us? In addition to the live support built in to the website, we are also offering iChat support for our customers! We know it's not rocket science... but we were the first! Sign Up now to take advantage! PR: With Net-Box Soft, consumers can turn virtually any PC or Mac mini into a complete digital home server. Axentra Corporation has announced that it will release a software-only edition of its award-winning Net-Box Home Server to power virtually any PC and Mac mini. Axentra's upcoming Net-Box Soft, is an all-in-one operating environment and software suite that turns a PC or a Mac mini into a dedicated digital home server appliance that incorporates unified interface and universal remote access, central file storage and sharing, backup and security, personal productivity and personal hosting server capabilities in one single plug and play cross platform device. Net-Box Soft for PC and Mac mini is based on Axentra's Network Appliance Operating Environment 3.0 software platform. "Net-Box Soft, a complete digital home server on a CD, is a revolution for the networked home" said Eid EID, CTO of Axentra Corporation. "Our software-only solution empowers consumers to choose their preferred hardware platform and configuration to install a dedicated home server that easily integrates into existing home network infrastructures while leveraging consumers' computer network devices such as routers, wireless access points, Windows and Macs computers, printers etc." The Net-Box Software Edition for PCs and Mac minis will be shipping in Q3 of 2005 and will retail for US$199.